If you’ve got children, you’ve undoubtedly dealt with bumps and scrapes along the way. Now MRSA (which is a strain of bacteria Staphylococcus aureus that are resistant to antibiotics) adds to the worry for parents. StaphAseptic is a first aid antiseptic and pain relieving gel that helps provide pain relief and also kills germs to help prevent infection, including MRSA. 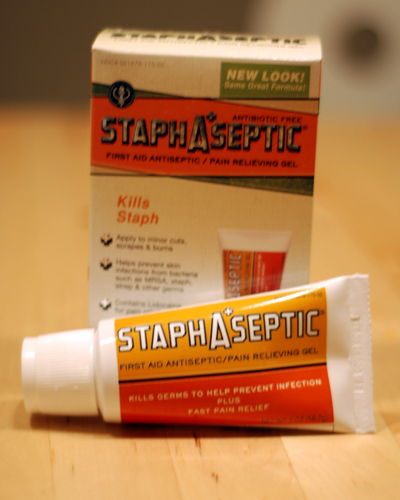 We were able to try StaphAseptic recently, and I’m glad to have it as a part of our first-aid kit! It has a nice scent of tea tree oil to it, and is nice and smooth without any hint of greasiness to it. You can try StaphAseptic too! Check your local CVS or Walgreens – and here’s a coupon you can use! One reader will win a full-sized tube of StaphAseptic. This giveaway is open to all US and Canadian residents. Entries will be accepted until midnight CST on Saturday, August 28. Mandatory Entry: Subscribe to my RSS feed and comment letting me know you’ve done so. Note: StaphAseptic provided me with two tubes of ointment – for review and for the giveaway. My review was not affected by the product provided – honest opinions were provided and my opinion remains my own. I was not compensated monetarily. $25 Cash Giveaway – Quick Draw! Can’t believe I’m the first to comment! I follow via google reader! I like frugal novice on fb! !